The order of the Charadriiforms (Charadriiformes) belongs to the class of the Birds (Aves) and to the infraclass of the Neognaths (Neognathae). It is a rather old order having originated 30-35 million of years ago; it is subdivided in 6 suborders which include 21 families and counting even 351 species which, altogether, live in all the parts of the planet. In the past, this order, counted a lesser number of suborders and consequently of species, having been the present classification object of successive expansions. To the order of the Charadriiforms belong species of birds of shapes and sizes quite different: curlews and woodcocks with the beak very long and thin, the puffin with the beak high and thin, the great skuas and the seagulls with hooked beak, the skimmers, the only extant birds having, physiologically, the lower rhamphotheca of the beak longer than the upper one, the buttonquails which morphologically resemble some small galliforms (order Galliformes), the jacanas having anatomic conformations similar to those of some rails (order Gruiformes), etc. The great morphological variety of this order goes together with a remarkable variety of behaviour going from aggressive birds, opportunistic and with expanding distribution ranges, like some species of seagulls, to birds with timid behaviour, elusive and poorly adaptable to the environmental changes such as the buttonquails and many species of wader and riparian birds. Despite this great polymorphism and accurate study of the anatomical characteristics and, more recently, of the genetic analyses reveal the kinship relationships of the families inserted in this order. Most of the species live along beaches, estuaries, lakes, rivers being their life linked to the presence of water; some species are pelagic. Many species have legs with palmate, semi-palmate fingers or with fingers rather elongated for swimming or walking in muddy and aquatic habitats. To this rule exist however great exceptions with species, belonging to some families, living n forest habitats and other ones living in arid and even desertic regions. The species living in marine environments have great salt glands in order to be able to drink utilizing the salt water. Usually, the species belonging to this order reproduce once a year producing a variable number of eggs (1-6 eggs) generally spotted and mimetic, depending on the species they belong. The chicks of many Charadriiforms are semi-precocious and in many species the young can go precociously out from the nest: the pullets of knots, plovers, avocets, stilts, phalaropes, jacanas and buttonquails are very precocious; they leave the nest few hors after the hatching and are able to beak the food by themselves. 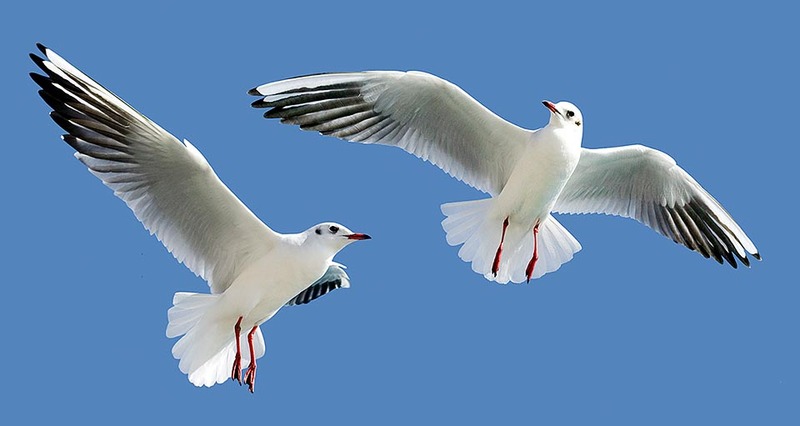 Most of the species nourish of fishes and aquatic invertebrates with great exceptions, such as many species of seagulls which are omnivorous or like the buttonquails which nourish of seeds and insects. Some strictly marine species such as the razorbills and the puffins occupy the same ecological niche as the penguins in the Boreal hemisphere: they nourish in fact offshore, diving in search of fishes or crustaceans, and using the wings for swimming under the water, unlike the penguins they are not wingless but do fly starting from the cliffs. To the suborder of the Lari belong the diffused and famous seagulls. 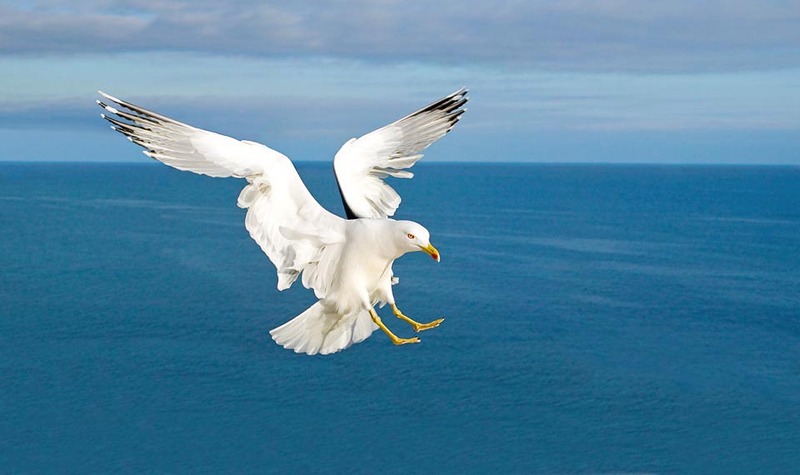 The seagulls (family Laridae) form a group of quite familiar birds due to the fact that some species are very common and also because some species are diffused also in habitats strongly anthropized living in contact with the man. They have massive body and long and pointed wings, the fore fingers are united by a swimming membrane. Head, tail and ventral parts of the body are generally white; the back and the upper parts of the wings have various tonalities of grey or are blackish. This contrast of colour white-grey/blackish is typical and identifier. Many species have dark colouration of the head (hood) more present during the mating season. The juveniles have darker colourations and can take some years for getting the final livery. They generally reproduce close to the coasts or in humid locations, often forming reproductive colonies, but their intelligence and versatility have meant that some species reproduce also in artificial habitats such as the roofs of the dwellings, taking advantage from the trophic sources present in the cities and in the landfills. The smaller species usually collect the food on the water surface or perform surface dives for catching the fishes. The big species are mainly sweeper or predator not only of fishes but also of eggs and pullets. As we said before, some species, small as well as big, have learnt to take advantage from the new locations and new trophic resources artificially created by the man. To this suborder (Lari) belong also the skuas (family Stercorariidae); big birds with dark liveries and shapes similar to those of the seagulls. In these birds the tip of the beak is aduncous. The skuas brood on the ground (isolated or in small groups) close and at the margins of the reproduction colonies of marine birds of various species. They nourish predating the pullets and the eggs of the same marine birds or stealing the food to some birds, always marine, chasing them and disturbing them insistently until they regurgitate the fished food which is often seized by the skuas. Finally, other species nourish eating mainly small mammals like the lemmings. 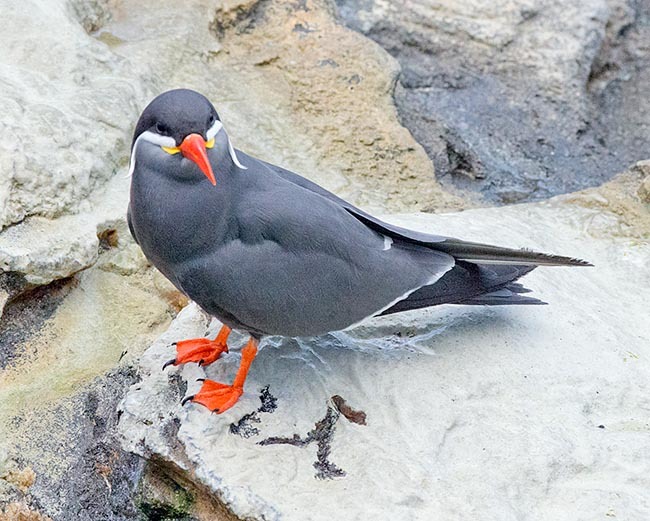 Also the terns (family Sternidae) belong to the group of the Lari; they have straight and pointed beak and forked tail. In respect to the other lari, they have more slander and lighter shapes, narrower wings, short legs and feet only partially webbed. The adult livery is reached during the first year of life. Also the family of the Auks (family Alcidae) belongs to the suborder of the lari. These ones are medium sized birds, have stumpy forms and vertical posture. The beak is often big and strong and often multicoloured being often site of sexual secondary seasonal characters. The most known species of this group are the puffins and the murres: these birds have short neck, narrow and short wings, shirt legs placed rather backward. The feet are webbed, the plumage is thick. They carry on a complete autumnal moulting, the pullets are pseudo-nidifugous, they effect vibrated flights and keep the legs open with the feet kept laterally and expanded for the landing. 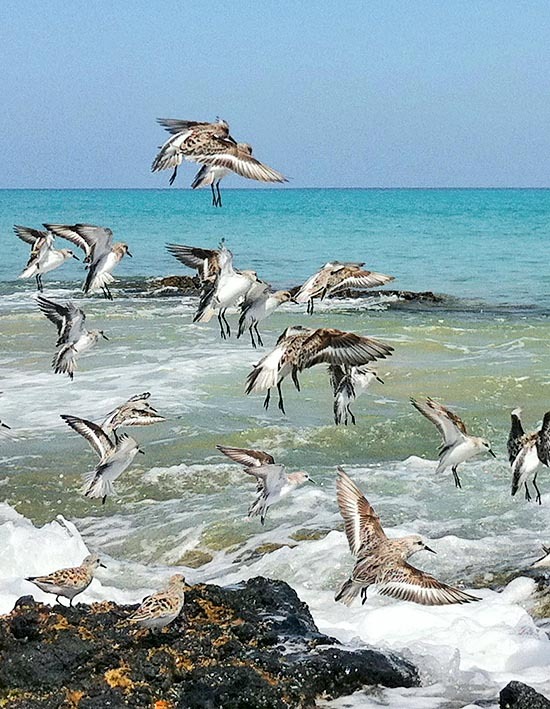 They are birds with pelagic habits, live in coastal and marine habitats and nourish of fishes, molluscs and crustaceans. Also the unusual skimmers (family Rhynchopidae), which count 3 species with tropical and subtropical distribution belong to the suborder of the Lari. These birds resemble in the forms the terns or sea swallows; the long lower rhamphotheca allows it to perform a unique fishing technique: they soar the water flying just above the same and then get back to the same wake seizing the small fishes with its peculiar beak which snaps shut, who are attracted in surface by the movement of the water and by the bubbles produced during the first passage. Other family belonging to the Lari is that including the pratincoles and the coursers (family Glareolidae), which are rather atypical charadriiforms as they live mainly in terrestrial habitats, open and arid with scrub vegetation or even desertic. They nourish of insects they actively hunt utilizing the hooked beak. They are native to the Old World as well as to the Australian continent. Finally, to the suborder of the Lari belong two more species, unique because each one is the only one species of its own family. One of these birds is the Egyptian plover (Pluvianus aegyptius family Pluvianidae) which is a bird with the colourful and contrasted livery living in the sub-Saharan Africa where it reproduces on the banks of sand along the great rivers. 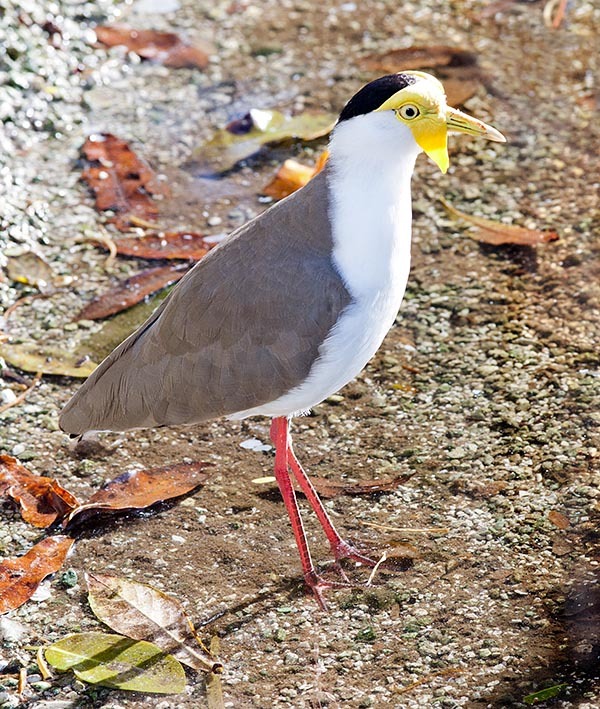 The other bird, unique of its genus being always the unique species of its own family, is the Crab plover (Dromas ardeola family Dromadidae). 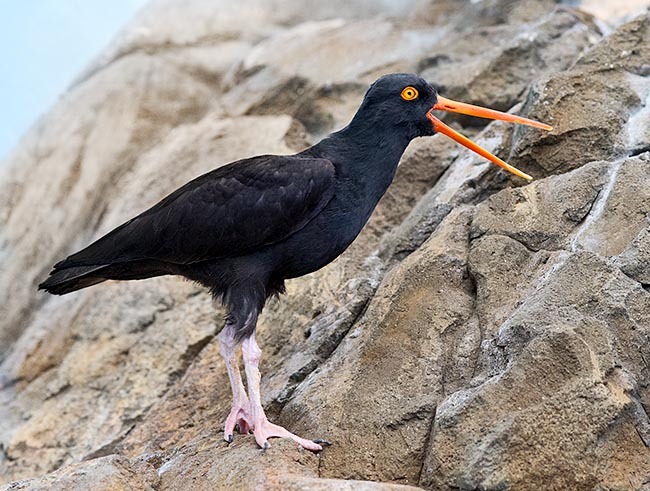 It is an unmistakeable bird because, even if having the shape of a ciconiiform and an elegant white-black colouration, has robust and evident beak it uses for seizing the crabs it eats. It lives along the coasts and the islands of the Indian Ocean. Other suborder belonging to the charadriiforms is that of the Scolopaci, which counts one family only (Scolopacidae) with many species. The birds belonging to this family are the woodcocks, the snipes, the knots, the phalaropes and similar. They are mainly cryptic birds with long and thin legs and beaks, nourishing of small animals, molluscs and insects they find in humid locations, in the prairies and in the woods where they normally live; the birds distinguishing more from this description are the phalaropes because more colourful, especially the females, and with the males caring the eggs and the breeding of the chicks. Other suborder of charadriforms is that of the Thinocori, to it belong 4 families with species of very different birds, some of which with quite a different look from the most typical charadriiforms. 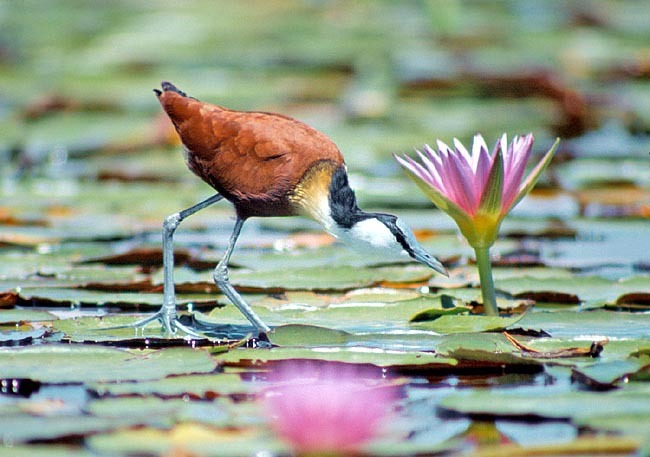 To this order belong the jacanas (family Jacanidae) which have similar shape and habits as the rails, living in aquatic habitats rich of vegetation and nourishing of insects and various seeds; their legs have very developed fingers for walking on the floating and surfacing aquatic vegetation. To another family of this suborder belong the so-called painted-snipes Rostratulidae); similar to the woodcocks in the strict sense but with showier colourations, more omnivorous diets and with species, like the jacanas, practising the polyandry with the males who care the eggs and the progeny. Always to the suborder of the Thinocori, finally, belong some little known birds. One is the plains wanderer (Pedionomus torquatus family Pedionomidae) which is the only species of its own family, endemic to Australia and resembling another sort of quail and living in some prairies where it eats insects and seeds. To a different family, always of to the suborder Thinocori, belong on the contrary some birds endemic to South America: the seedsnipes (family Thinocoridae) which count 4 species having an intermediate morphology between that of a galliform and that of a columbiform. They have an unusual, being charadriforms, vegetarian diet. To the suborder of the Turnici belong the so-called buttonquails due to the resemblance these birds, included in a unique family (Turnicidae) counting 17 species with the real quails. As a matter of fact, in the past the buttonquails had been considered as similar to birds belonging to different orders and included in the galliformes order as well as in the gruiformes one. These are small coursers and mimetic birds nourishing of insects and seeds, living in the grassy locations from South Europe to Africa, continuing in Asia up to Australia. Usually, the females are little bigger and more colourful; the males take care of the hatching and of the chicks. 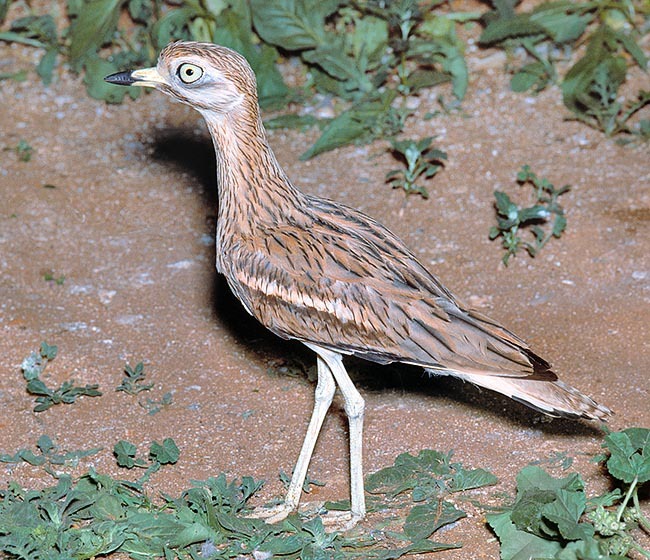 To the suborder of the Chionidi belong the curlews (family Burhinidae) which have medium-large dimensions, well developed eyes, strong and straight beaks, and long legs. They live in the temperate and tropical regions of the whole world, have crepuscular-nocturnal habits and nourish of insects and various little bigger small animals. Also the sheathbills (family Chionididae), squat marine birds resembling pigeons, completely white with Antarctic distribution, belong to the same suborder of the curlews. There are only two species of sheathbills (with some subspecies); they are manly sweeping birds as they nourish of carrions but they do not disdain to predate eggs and chicks of other birds; in spite of being seabirds, they have non-webbed legs. Also the Magellanic plover (Pluvianellus socialis family Pluvianellidae) is a charadriform, endemic to the extreme South America, belonging as only species of its family to the suborder of the sheathbills. 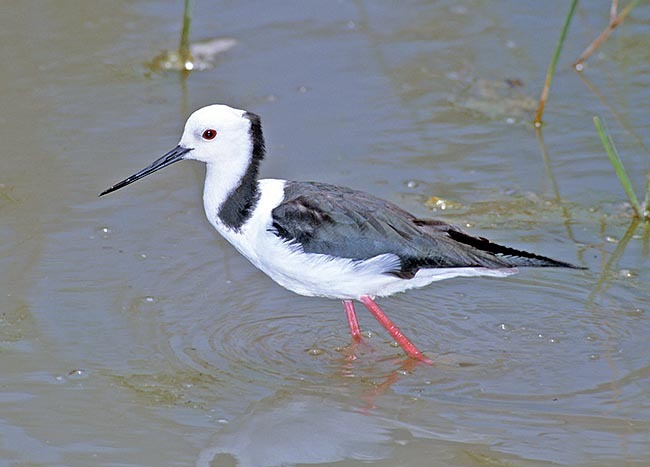 The last suborder of the charadriiforms is that of the Charadrii which includes the avocets and the pied stilts (family Recurvirostridae) characterized by the usually white-black livery and by utilizing the long, curved in the avocets, beak moving it on the surface of the water for intercepting the small aquatic animals of which they nourish. Also the pewits, the plovers and the oystercatchers belong to this suborder. The oystercatchers (family Haematopodidae) are famous for being able to force and break the shells of the molluscs of which they nourish; they are also known under the name of common pied oystercatchers and can nourish also of marine small animals of other type. The pewits, the plovers, the coursers and the Kentish plovers belong to the family of the Charadriidae and live in the fields and in the prairies, close to the se and the water, of all the world; however counting few species which may live in drier locations. They generally hunt small animals and insects using their eyesight and performing rapid and typical runs. They have compact body, more or less long beak and legs depending on the species and rather long and pointed wings. They lay their eggs, spotted and very mimetic, on the ground; the chicks are very precocious and leave the nest after a few hours from the birth. Finally, to this order belongs the Ibisbill (Ibidorhyncha struthersii family Ibidorhynchidae) the only species of its own family. It lives in central-eastern Asia and, as the name says, even if morphologically resembling an ibis it is not a pelecaniform but a charadriiform.